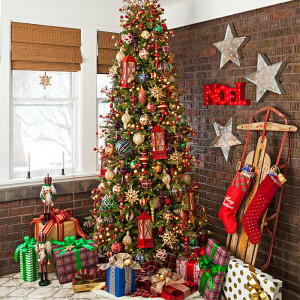 It’s beginning to look a lot like Christmas and that means your house will soon be overrun with clutter. Wrapping paper, bows, boxes, food, decor, and so much more will take up a lot of space. But you don’t have to suffer from Christmas house clutter this holiday season. You can take control and clamp down on clutter so you can actually enjoy yourself during this festive time of year. You’ve just got to know different ways to deal with Christmas house clutter. Clutter is everywhere and it’s no wonder why it grows. We all accumulate so much stuff and then stuff it into a storage space, closet, garage, shed, or corner. Like dealing with old fitness equipment, Christmas house clutter seems impossible to control but it can be done. The trick is to purge, get organized, and purge again. Part of the solution is reusing items. For instance, you probably have decorations you reuse every year. Cut down on it and give away and/or throw out the excess. Pick up all the garbage. Face it — your house is full of junk you don’t use, don’t need, and really don’t know why you hold onto it. Be brutal, walk through your house with garbage bags and have at it. Purge as much as you can; it will make a noticeable difference. Plus, you’ll wonder why you’ve waited so long to do it. Clean out your kitchen. The kitchen is often a catchall location, like the garage and/or shed. When you don’t know what to do with something, you put it out of sight. Your kitchen is the same way, with non-perishables used months ago for certain recipes. Then, there’s all the other food, utensils, dinnerware, and more which can easily go. Identify items to regift. There are going to be things you do not want given to you as presents. Instead of sticking them somewhere, just regift them to people who will appreciate those items. This is a great way to give without spending money and it cuts down on clutter. Have a plan for the big day. On Christmas day, boxes, wrapping paper, and more are strewn across your house. But if you are proactive, you’ll find clean up is a cinch. Simply have bags and/or boxes dedicated to trash and reusable items. Make a donation bag to give away. If you receive gifts you don’t want to keep, you can make a donation bag to give them away. In addition, go through your closets to find clothes you no longer wear and other items which someone else could put to use. When you need to get rid of clutter around the house, just phone 800-433-1094 or visit Junk Garbage Removal. We can help you reclaim precious space and be more organized.